Despite negative indicators such as the fall in UK productivity and decline in new car registrations, Britain’s contract and subcontract manufacturing market appears to be going from strength to strength. 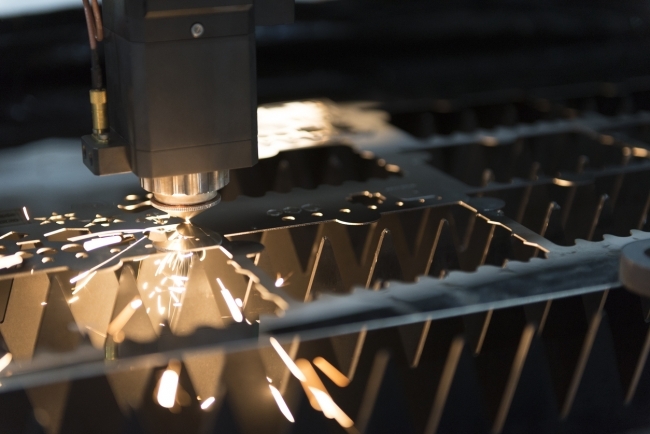 According to the latest Qimtek Contract Manufacturing Index (CMI), which measures the value of contract and subcontract manufacturing orders placed in the market, the sector was up 24% on the previous quarter. The CMI stood at 215 for the third quarter of this year compared to 174 for the previous three months. Compared to the third quarter of 2016 the market was up over 40% from a CMI figure of 153. The base line CMI figure of 100 represents the average value of the subcontracting market during 2014. The CMI is produced by sourcing specialist Qimtek and reflects the total purchasing budget for outsourced manufacturing of companies looking to place business in any given month. This represents a sample of over 4,000 companies who could be placing business that together have a purchasing budget of more than £3bn and a supplier base of over 7,000 companies with a verified turnover of over £25bn. Looking at the figures on a process-by-process basis, the strongest growth was in fabrication and sheet-metal work which was up by 50% on the second quarter of 2017 and up 62% on the third quarter of 2016. Machining was up by a more modest 3% on the previous quarter, although still up 28% on the previous year. Other processes, which include contract electronics manufacture and plastic moulding, were up 5% on the previous quarter but down 2% on a strong third quarter in 2016. Overall fabrication orders made up 52% of the market, with machining on 40% and other processes on 8%. 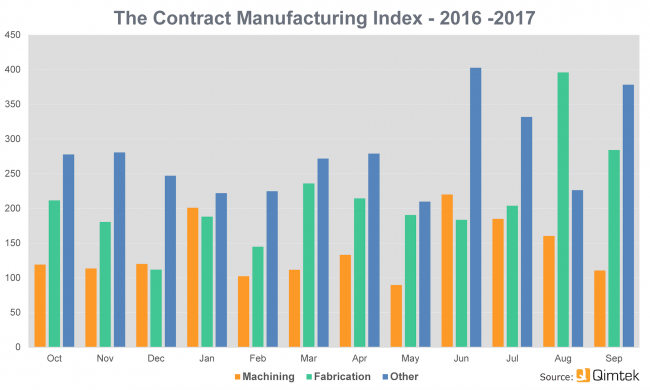 Below – The Qimtek Contract Manufacturing Index showing movements in demand for machining, fabrication and other outsourced manufacturing services over the past 12 months. 100 = the average monthly figure for 2014.